If your kitchen sink springs a leak or the toilet stops flushing, the 24/7 maintenance teams at our Springs communities are ready to respond quickly and efficiently. But what about those everyday tasks like hanging pictures and assembling furniture? Are you prepared to handle these minor but necessary jobs? You might have randomly picked up a hammer or some duct tape along the way, but that won't get you by. Don't wait until you need these items to add them to your toolbox. So you have the basic slotted and Phillips head screwdrivers and called it good. Cordless power screwdrivers are not just for professionals or heavy-duty maintenance jobs. They're versatile and compact enough for a wide variety of uses. You'll be thankful when it comes time to assemble that new entertainment center. If you're a crafter, you may already be acquainted with the benefits of this handy tool. When it comes to household use, a hot glue gun can do everything from repairing a torn hem or loose sneaker sole to fixing stripped screw holes — and it's much easier to work with than super glue. Have you ever found yourself overstocked with something like tomato sauce because you couldn't see what you had stashed on the top shelf of a kitchen cabinet? Keep a step stool on hand for those times when your arms and legs just won't stretch far enough. Hanging pictures or other wall art usually becomes a two-person production, with one person trying to direct the other, and more often than not it ends with frustration. A laser level eliminates guesswork and prevents a lot of arguments. HDTVs, laptops and tablets need clean screens for maximum performance, but paper towels or rags can leave scratches. Microfiber cloths are perfect for cleaning all your electronics as well as any other delicate surfaces. A package of two dozen costs less than $20 so you can use a fresh one each time, and they're washable for multiple uses. 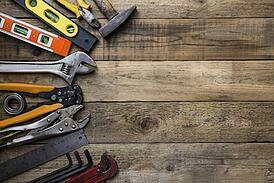 If you had to get by with just one household tool, what's the item you couldn't do without? Tell us in the comments!